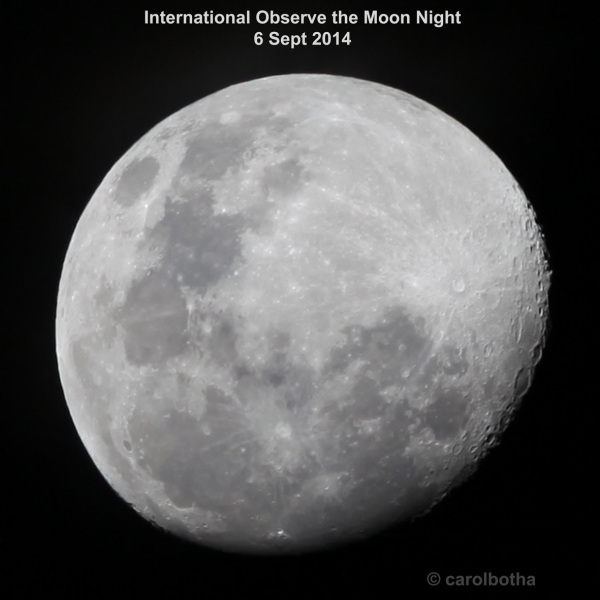 International Observe the Moon Night was celebrated on 6 September 2014. All over the world people gathered to observe a brilliant Moon in gibbous phase. The human brain seems to crave rhythm. Though solar, lunar and seasonal cycles play a lesser role in modern society, the behaviour of our ancestors depended on these natural rhythms. Scientists have been doing intensive studies on circadian rhythms. These are physical, mental and behavioural changes that follow a roughly 24-hour cycle and produced by natural factors within the body, but are also affected by signals from the environment. Although not yet scientifically proven, some individuals believe that the Moon has a great influence on their well- being. They argue that if the Moon governs the tides, surely it would have an influence on the human body as well. There is one problem with this line of thought. The oceans are vast. An individual is but a very tiny speck on Earth. The Ocean tides are controlled by the forces of gravity (tugging) of the Moon and Sun as well as by the rotation of Earth. Coastal areas usually experience two high and two low tides every 24 hours and 50 minutes. High tides occur 12 hours and 25 minutes apart. It takes six hours and 12.5 minutes for the water at the shore to go from high to low, or from low to high –the rhythm of ebb and flow. The Earth’s axial rotation and the Moon’s orbital rotation result in a catch-up situation and moonrise for a specific location will be about 50 min later each day. The Moon is also visible during the day, except during new moon, when it occupies the same region in the sky as the Sun and at full moon . Humans are by nature inquisitive. The Moon is tidally locked to our planet (its orbit of 27.5 is the same time as its axial rotation), showing just one side to us here on Earth. It was only natural that we wanted to know what the far side looked like. Once humans realised that the distance to the Moon could be overcome, missions to the Moon became commonplace and we now know that the most beautiful side is facing us! Some say they can see a man on the Moon. During full moon I definitely see the rabbit who is still patiently mixing an elixir for Chang’e to be able to return to her beloved husband, Houyi, as in the Chinese legend. In a world of bright lights we no longer rely on the Moon to guide our daily activities. How often do we forget that it is up there? Yet sometimes as you draw the curtains for the night it surprises you and your gaze locks in utter fascination.